• DESCRIPTION: Mode - BHS TM 150, DTHR is a Tractor drilling rig mounted on a tractor model New Holland 7500 4WD (75HP) with Top Drive all Hydraulically Operated Drilling Rig extracting main power from Tractor Engine, is capable of drilling using DTH method to Depth of 150 Mtrs. a) 4 ½” (115mm) dia holes upto a depth of 150 mtrs in Rock Formation. b) 6 ½” (165mm) dia holes upto a depth of 20 mtrs in Rock Formation. c) 14” Dia holes upto depth of 15 Mtrs in Rock Formation. Sturdy structural mast of welded construction, main members made out of heavy duty structural steel channels reinforced with suitable cross members, with Mast length of 5500 mm, Rotary head travel of 4500mm, centralizer Opening of 254 mm i.e. (10 inches) and Raising and lowering with the help of Hydraulic Cylinder. Top Head Rotary Drive Heavy duty hydraulically driven top head drive with mud swivel travels on the mast constructed to with stand the drilling shock loads its speed ranges from 0-100 rpm and torque of 33,000 in-lbs. (380 kgf/m). 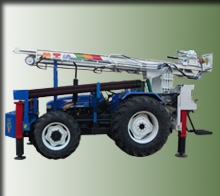 Feed system is provided with adequate travel for handling drill pipes up to 3 Mtrs Long. The feed and hoist are actuated by a suitable hydraulic cylinder with wire rope and pulley arrangement. The feed system has a Pull up force of 5000 kgf i.e. (1100 Pounds), pull down force of 3000kgf i.e. (6600 Pounds, pull up speed of 15M/Min pull down speed of 34 M/Min and Reeving Ratio i.e. (wire rope) of 1:2. Hydraulic System has a Capacity of Maximum Operating Pressure of 160 kg/cm2with a Hydraulic Tank Capacity of 200 Lts, Filtration (Nom) Return line of 10 microns and a Hydraulic Oil Cooler of 40GPM 2250 PSI(Fin type oil to Air). System consists of four Hydraulics levelling jacks with reverse flow restricted valves to ensure safe operation. Two numbers are at the Rear (Operator) of the rig controlled by two separate valves and two jack in the front side of the rig controlled by a single valve. The drill rig will be provided with hydraulically operated triplex Reciprocating pump of capacity 36 LPM at 400 PSI for injecting water/foam with necessary piping and flow control valve. 20KN Capacity main hoist with 40m/min. speed (with bare drum) with Cable of 30m length will be provided. with 3 KN capacity with 120m/min. speed (with bare drum) with 6mm Cable dia 500 meters length will be provided. The rig is provided with centrifugal pump of suitable make which is suitable for handling clear water, and bentonite solutions. Air line lubricator capacity of 475cfm/150psi shall be mounted for the supply of lubricating oil to the hammer.